Kenneth Graham is an extremely busy 24-year-old and when he's not at home in Muff in County Donegal he's on the road with his horses in a lorry packed with his feed from Bluegrass Horse Feeds. This year Kenneth has become a Bluegrass Horse Feeds brand ambassador and he is delighted with the support he receives from Bluegrass. Kenneth grew up at Lenamore Stables which is uniquely placed on the border of Derry-Londonderry and Donegal and the stables have been in the Graham family for over 100 years. Lenamore Stables is proud to be a member of the British Horse Society and the Association of Irish Riding Establishment and has more than 30 well-trained horses and ponies suitable for all ages and all levels of riding, and a great team of experienced, qualified Riding Instructors who are always friendly and professional throughout your horse riding experience. Kenneth himself has around 20 horses which he uses himself for his competitions. His discipline is showjumping so life for Kenneth is mostly on the road. "I was in Lanaken recently for the World Young Horse Championships with Pacino Amiro. It was a long journey but it was great. I travel quite a bit be that to Cavan, Portmore, Dublin and international arenas. "At the start of the year I took a pallet load of Bluegrass Horse Feeds with me to Spain which was brilliant. The feed is great and I have been feeding all of the horses at Lenamore Stables for a good few years now. It was important for me to be able to take the pallet with me because I needed six weeks' supply. The Bluegrass Horse Feeds packaging is brilliant because it's very strong and it doesn't rip while you're travelling. "I had a great weekend jumping at Barnadown last month. Regula Wassmer’s, ‘Tullabeg Jackson’ divided the four-year-old class by jumping three out of three brilliant clear rounds. 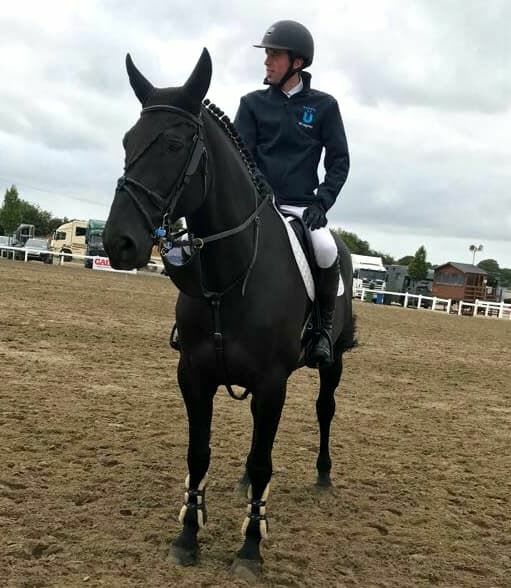 George was placed second in the Leinster Grand Prix Final and Pacino Amiro showed great form again qualifying for the final of the five and six-year-olds Breeders Classic Final where he had an unlucky pole in the jump off to place eighth. "And back in August Pacino Amiro came third in the National Cruising six-year-old final at the RDS. Democrat also won another Ulster Region GP at the Antrim Show while Lyrical jumped a super double clear to be placed fourth. "The feed from Bluegrass means everything. The horses all look fantastic and they are feeling fantastic so they perform well. "The season for me is coming to an end with the Northern Indoor Championships in October, the Portmore Autumn Championships are also this month and the season finishes in November with the Cavan International." But when he is not travelling, Kenneth is at home in Donegal focusing on his young horses.